Monash University continues works to install a nature walking track, which can also be used as a circuit track around Clayton campus. The Monash Circuit will consist of a 1km and 2km loop tracks, both circulating around Monash Clayton's Sports precinct. 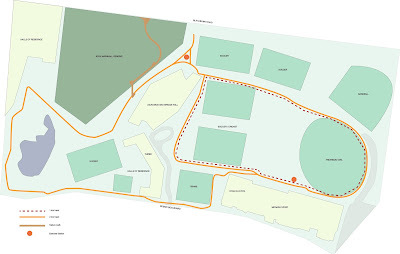 The track will circumnavigate Monash Sport's top terrace (sports ovals) including Frearson Oval (Oval 1) as well as the main soccer pitches behind Monash Sport. This will form a 1km loop track. The 2km track will include this loop, and carry on around the Jackomos and Brigss Residential Halls, where it will connect with existing pathways around the hockey pitch and lake. The track will then return along Scenic Boulevard and link up with the 1k loop track, to form the 2km loop track. Drinking stations, pedestrian lighting for evening use, two exercise stations and distance markers will be placed along the track. The project also includes the installation of a nature walking bridge through Jock Marshall reserve, linking the University through to Blackburn Road.